Check out these cool VT ultimate pinnies going to our friends in Blacksburg from Lightning Wear. VT ultimate frisbee pinnies from Lightning Wear®. 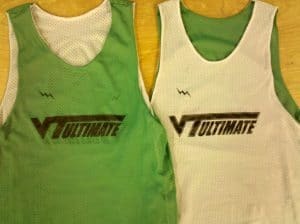 Some green and white VT ultimate pinnies are on the way south to VA. Thanks for the order. Ultimate frisbee is one of the greatest sports that you could ever try. Look great with your team with some custom pinnies made to order using our custom pinnie maker. Design online or call us with team details. We can work up and amazing set of lacrosse pinnies that will be the envy of other teams. Made in the USA.